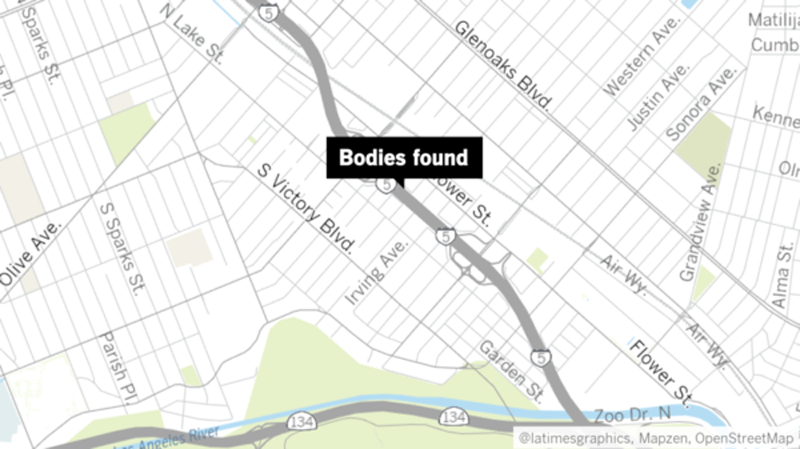 At least three dead bodies were discovered in a parked vehicle in the city of Burbank on Tuesday, police said. “This is a homicide involving a parked vehicle,” Sgt. Derek Green of the Burbank Police Department said. The bodies were discovered during the investigation of a parking complaint in the 1300 block of South Varney Street just after 7 a.m., according to Green. As of 1:40 p.m., investigators had the area cordoned off with yellow police tape. Lisa Alvarez, who works around the corner from where the bodies were found, described the vehicle as a red Jeep and said she first noticed it parked in a no-parking zone about noon Monday. "It caught my attention because it wasn't supposed to be parked there but It didn't look suspicious. I thought, 'Oh that car is going to get a ticket,” Alvarez said. “Its terrible. I am so sorry." She said that police blocked off the street early Tuesday morning. She described the street as industrial and generally quiet.